Take a look at the accompanying visual. Visuals simplify the appearance of complex reality. With the caveat of this being a conceptual model, it is still a useful one to find our place in the world. 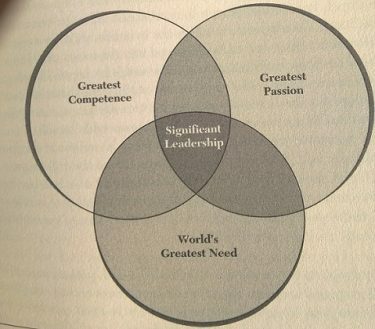 Significant leadership is the space where your greatest competence, your greatest passion and the world’s greatest need overlap. Where does one begin? Sachin Tendulkar began with his passion, and you might be surprised to know it was not batting! Tendulkar wanted to become a tearaway fast-bowler. When he went for Dennis Lillee’s fast-bowling camp, Lillee saw him bat and told him to forget about fast bowling. Isn’t that interesting? One of the greatest batsman in modern times needed feedback on his greatest competence! What comes in the way of identifying our competence? Ironically, it is the sheer ease of it, so much so that we do not think about it at all. What comes easy to us is dismissed. You can reflect on what is it you find very easy to do that is something of a task for your peer group ( people who have similar life-conditions).We should not stop the search with the first identified easy thing. Why not explore many things and see! You may be very good in the first identified easy thing but you may turn out to be brilliant in something totally different. Ask, what is incredibly easy for me and seems to be a big deal for others? What about your greatest passion? The elephant in the room is the perceived imperative to find the most secure and prosperous means of livelihood. This imperative pushes everything else in the background. Sometimes, the trappings of acknowledged success are much too strong. Or the fear of failure. And so, millions of people never come round to even asking the question. As I said, reality is much too complex and there is no formula. If time beckons those who are seeking, they will grapple with this question. One good indicator is that contemplating failure and even experiencing it does not deter you. Even knowing beforehand that you will most likely fail does not. The test of failure is a good one. Ask, what matters to me so much that that I don’t mind failing. Now is a good time to bring in triangulation. Triangulation enables us to validate findings and establish their worth by cross-reference to other sources as well. First step, ask, what matters to me so much that I don’t mind failing. Take the answer and revisit the first question, what is incredibly easy for me. Incredibly easy means far away from the prospect of failing. The two answers make an odd pair. Now, turn to the world’s greatest need and ask – what does the world truly need? This answer can reconcile a lot between the odd pair answers. This answer is external and independent of you. And yet, because you are a part of the world it cannot but encircle you. During the Indian freedom struggle, for example, the world’s greatest need would have reconciled many answers for people living through those times. The future that brings Artificial Intelligence and automation will recast the question on your greatest competence and the one on the world’s greatest need as well. Your greatest passion might look like the anchor for stability at such a time. Triangulation as a process will continue. Visuals simplify the appearance of complex reality. Let this model help you go beyond the appearances.